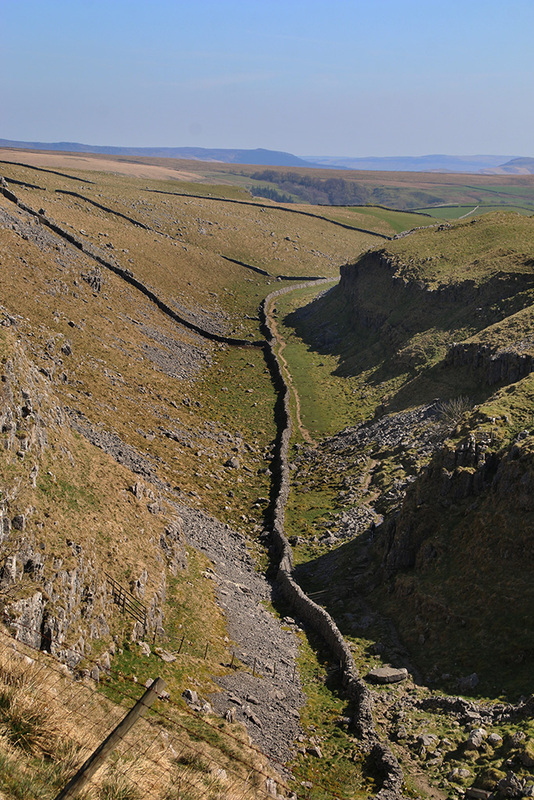 A pleasant figure-of-eight route uses part of the Dales Way long-distance walk. There are good views of Dent (above) and the surrounding hills, and thankfully for my creaking knees, no gradients to speak of along the way. 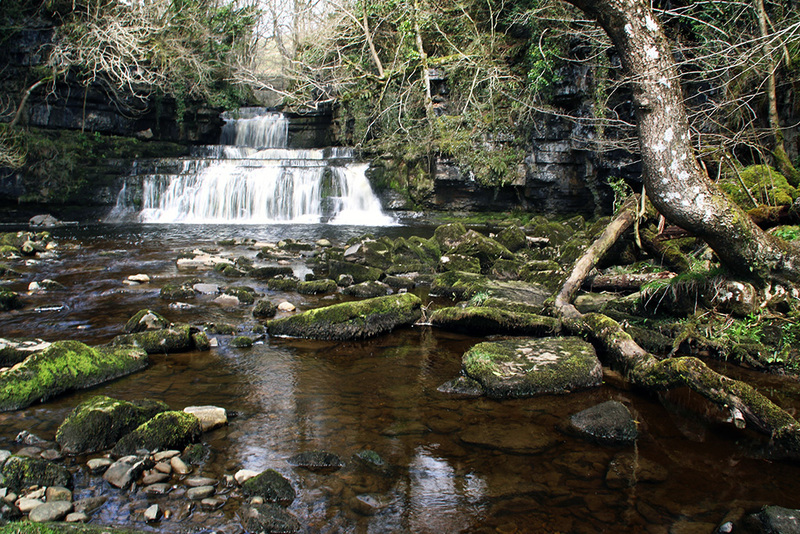 The sound of water cackling over stone, frantic calling between ewes and lambs, and birds being busy doing what birds do in spring made this a very pleasant couple of hours. 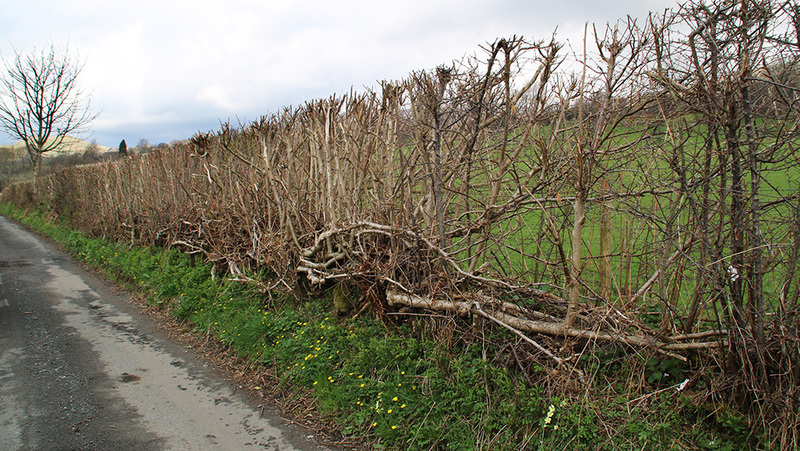 Just thought I’d throw this pic in to show that the Dales isn’t all about drystone walls – here near Dent the art of hedge laying can be seen. I read this week that one Yorkshire pensioner shoots wild birds in his back garden because he “dislikes being disturbed” by their singing. He wouldn’t be very happy round my way at the moment as the swallows are returning after their winter hols abroad. I can’t imagine a world without birdlife. If it is irritating noise he dislikes I suggest he takes the gun down to … probably best not to continue on this line of thought. 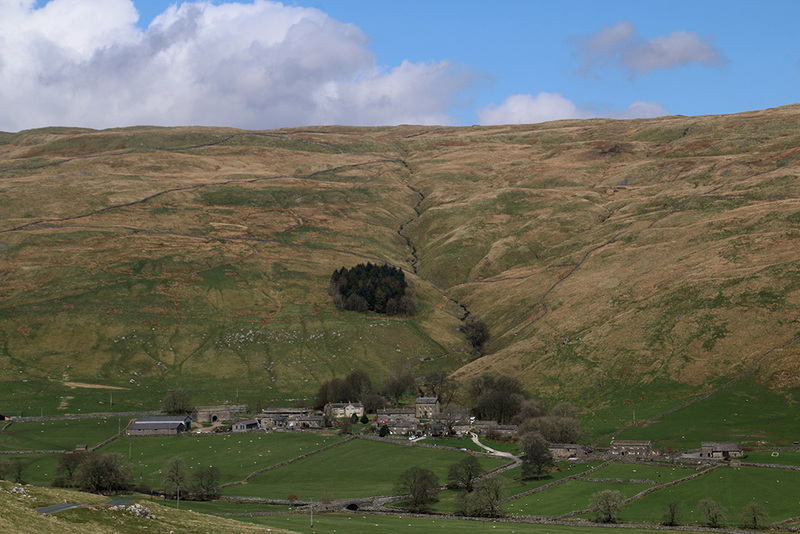 From Dent I drove through the Dales calling at Sedbergh, Hawes and Askrigg – stopping off to photograph ponies in front of the Howgills, Cotter Force (above) and St Oswald’s in Askrigg (below). 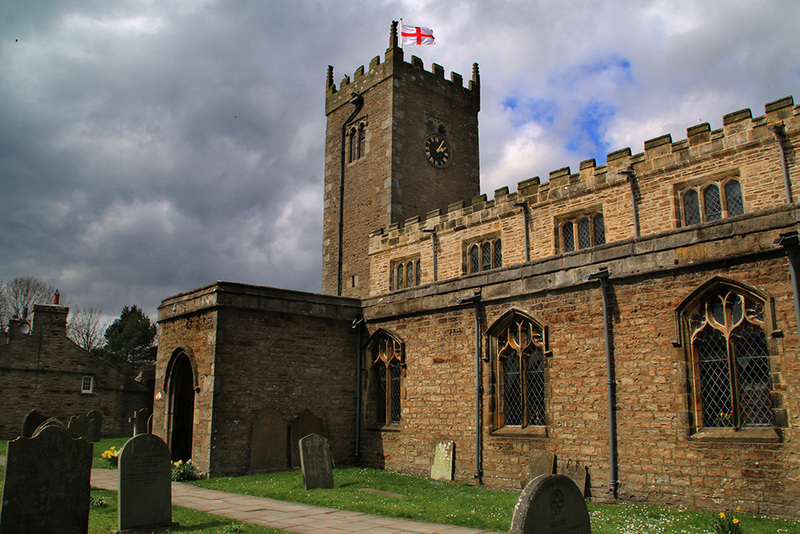 The church is Grade I Listed, dating from the fifteenth century with evidence of earlier building. 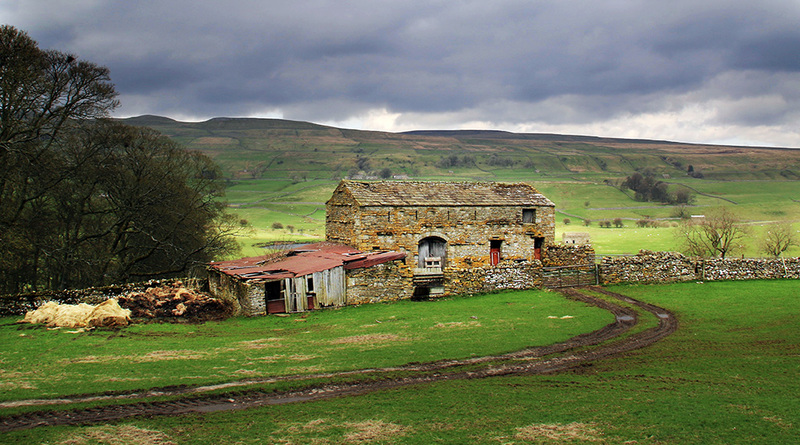 Afterwards I just had to stop to capture a very different but just as architecturally important Dales barn beside the Ure in Wensleydale (top picture in blog). 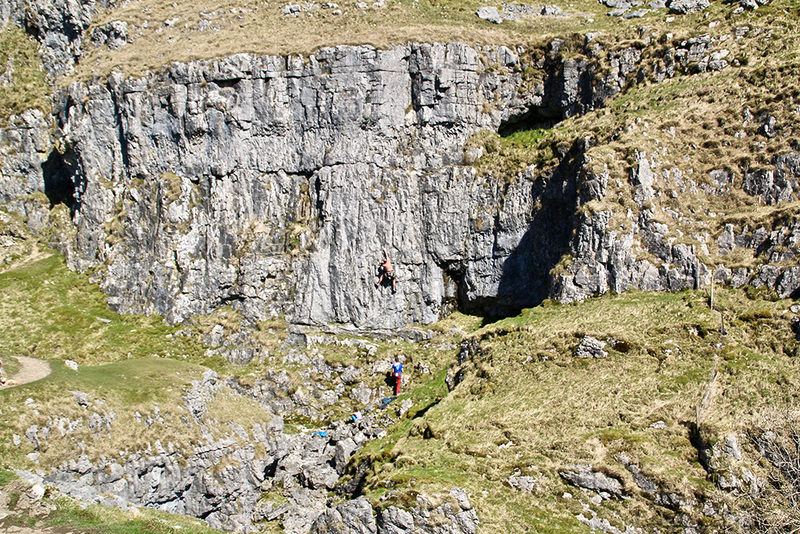 I also had a quick trip one evening to Malham where some macho outdoor types were climbing bare-chested above Watlowes. I can think of more relaxing ways of getting a tan. 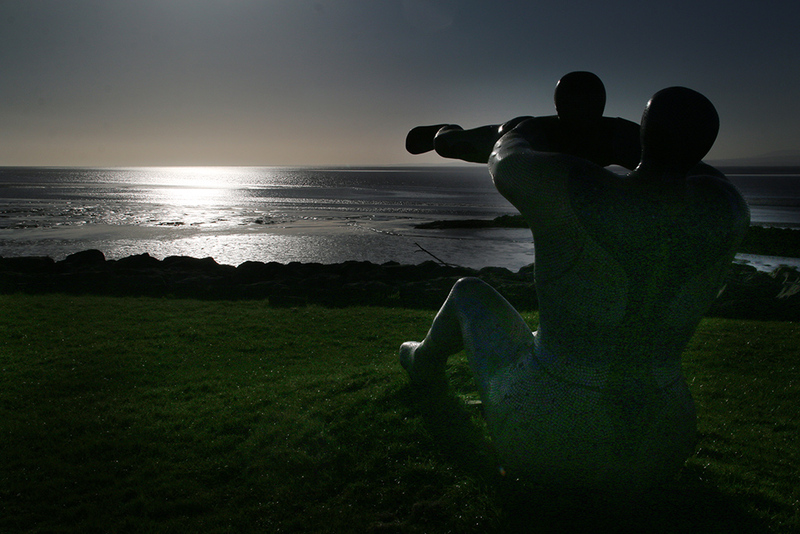 Photographic highlight of my week though was a trip on Friday evening to Morecambe. 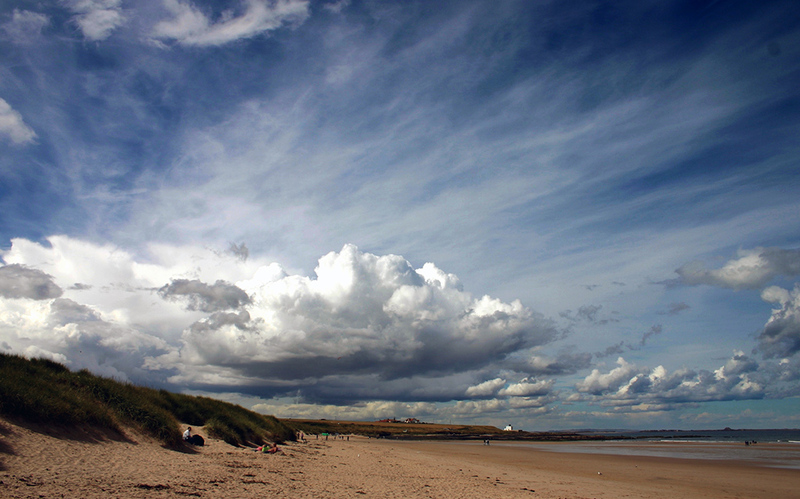 Despite living in the Dales, the bay is less than 30 miles away. 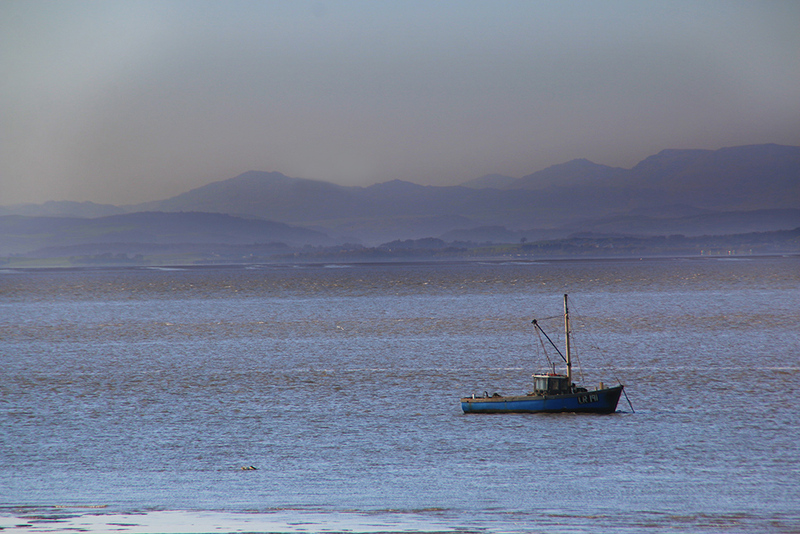 Seen from the shoreline, the Lakeland Fells were just a grey-blue silhouette across the water. 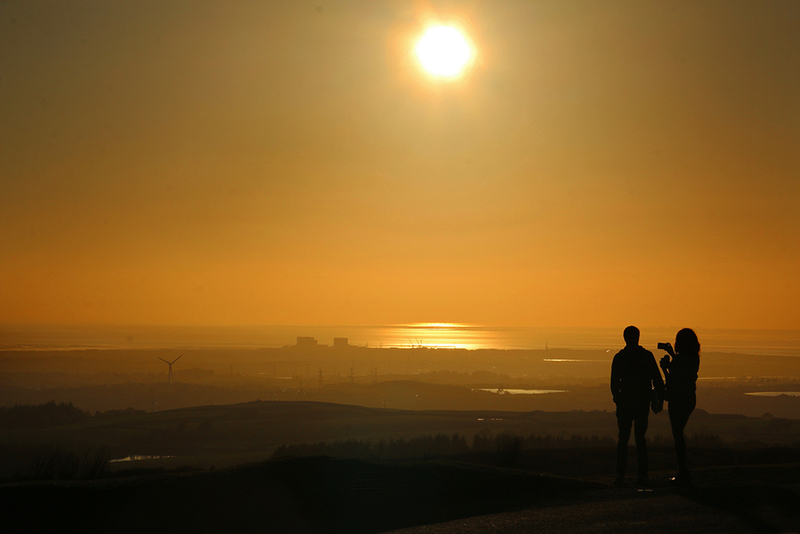 I headed home via the Trough of Bowland, stopping off at Jubilee Tower on Quernmore to witness a superb sunset. 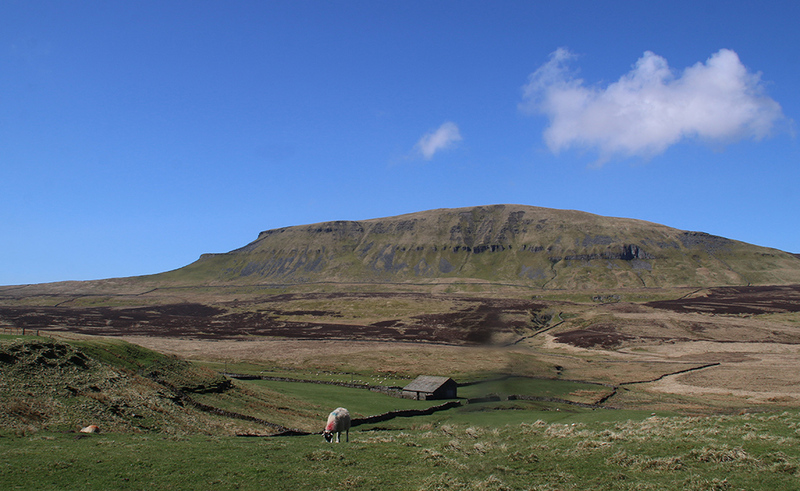 Ribblesdale, of course, provided more spring joy. 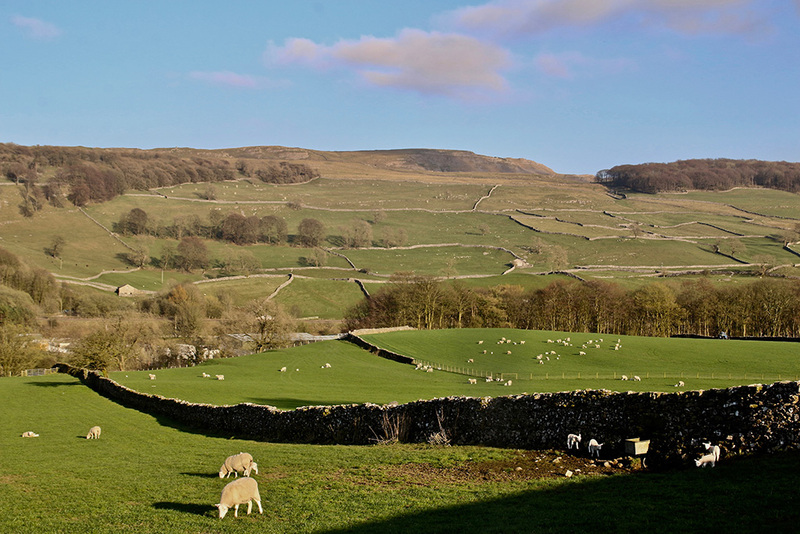 A short evening wander up the narrow road to Little Stainforth opened up this lovely pastoral scene (below). I’ve taken dozens of photos this week but I don’t want to be that bloke who bores you with his tedious, endless holiday snaps (oops, too late!) so I’ll save some for another day. 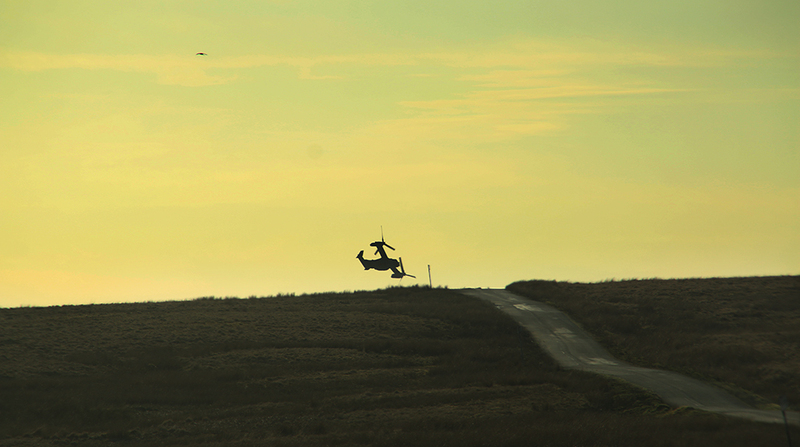 I was driving back from Malham to Settle at dusk when this strange flying machine buzzed overhead – so low, I expected to hear an almighty crash from over the horizon. Does anyone have any ideas about what it is and why it almost took the aerial off my car roof? 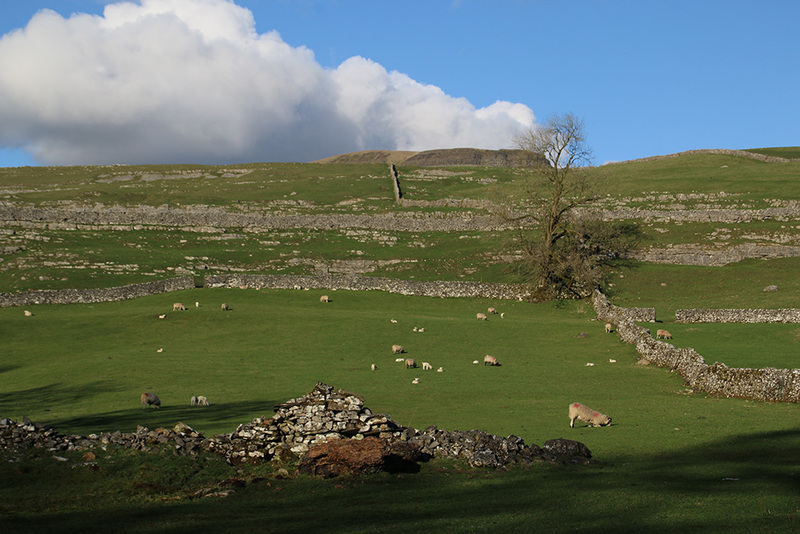 This isn’t the crispest shot I’ve ever taken – a hand-held zoom in poor light – but a beautiful reminder of exactly what I saw as I drove along the Settle to Malham road in the Dales before people began to fill up the day. 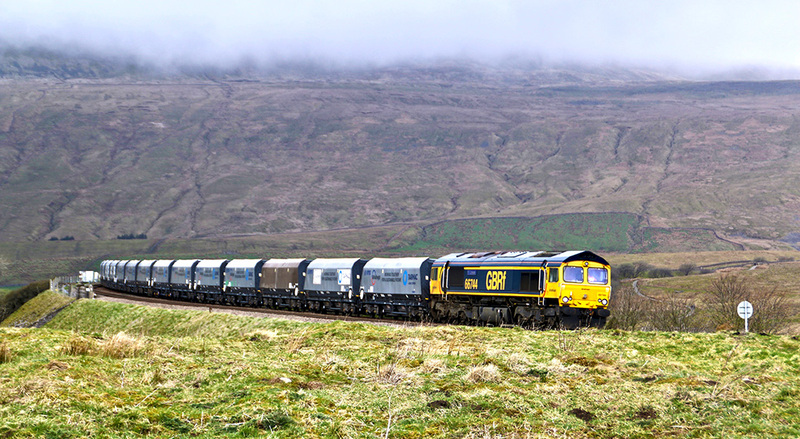 The photo was taken at 5.45am on Friday near the brow of the pass between Ribblesdale and Malhamdale. The temperature gauge in the car read -1 deg. Facing me, a glorious blood-orange horizon with a tiny strip of the tarn sparkling out of the gloom. I motored on and stopped at the tarn to watch the sunrise. 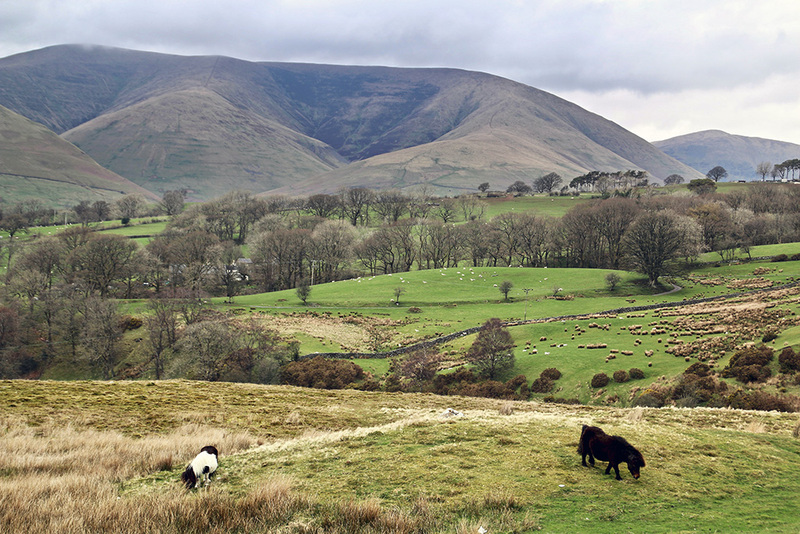 Gradually the colour of the surrounding hills began to redden. 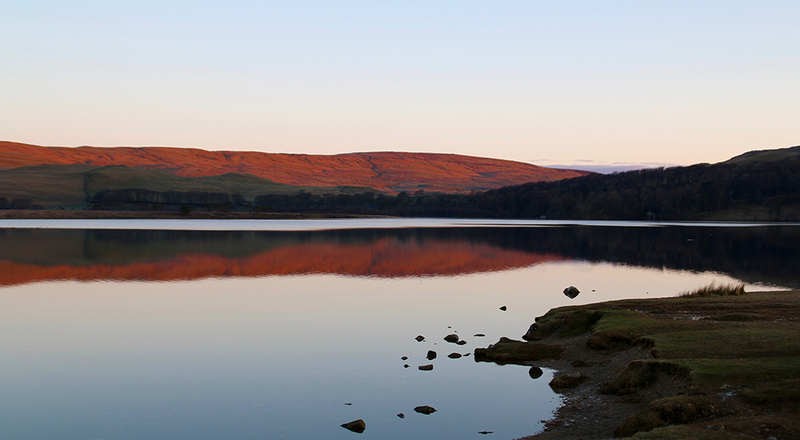 Although the tarn remained shaded from the rising sun for a while, the water weakly reflected the hue of the transforming hillsides; the lake was still and cold. The peaty ground crunched gently as I walked around the tarn’s edge. The previous day’s puddles wore a thin veil of ice. A curlew called and a pair of peewits were up, whirring about above my head. Four geese in an unruly line barked like dogs, their conversation echoing round the natural bowl as if in an empty swimming pool. There was a faint rustling then a flash of colour as a grouse scuttled off just two yards from my feet. A nervous lone rabbit scanned the scene before hopping it. 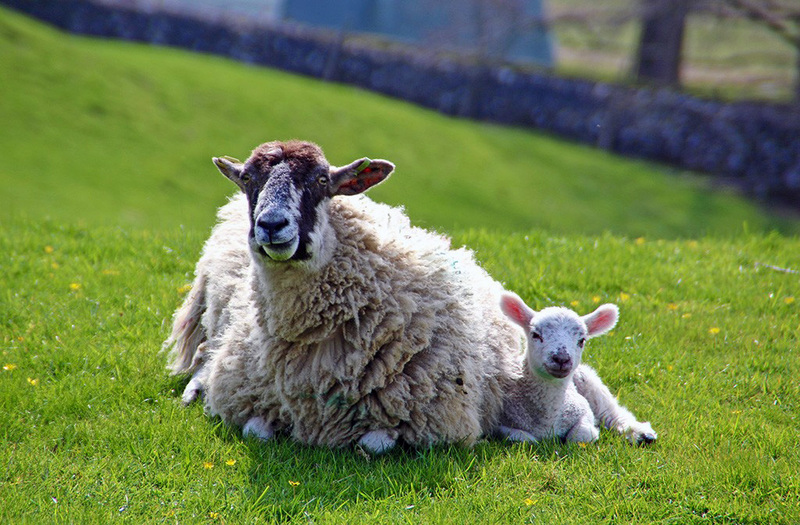 In the adjoining field a group of sheep remained seated on their warm patches of moor, chewing and wondering whether it was time to get up. Black silhouettes of cattle stood on a dark distant hill like a hastily arranged background for a school play. Suddenly, the bright new sun popped up from behind a thicket on the horizon. I couldn’t look at it without damaging my eyes but I pointed the camera in the general direction and hoped for the best. 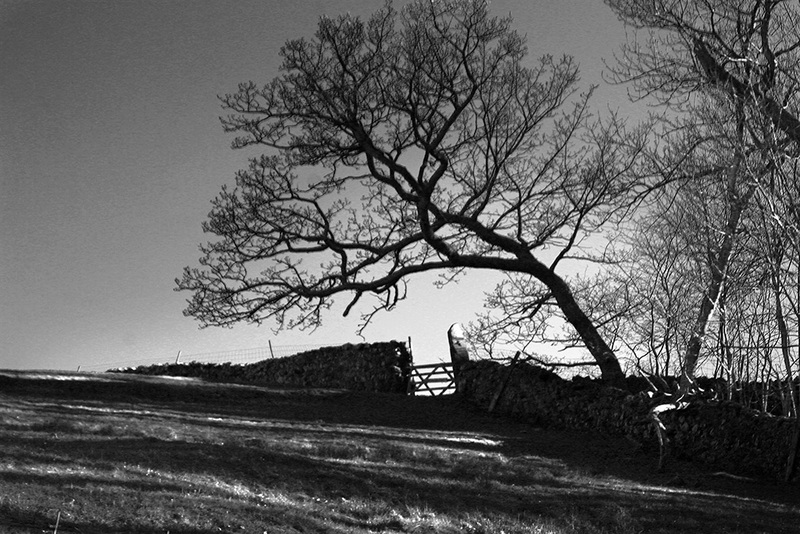 Once again the Sun had successfully made its way up Mastiles Lane from Wharfedale and was about to head over the hill to Ribblesdale. 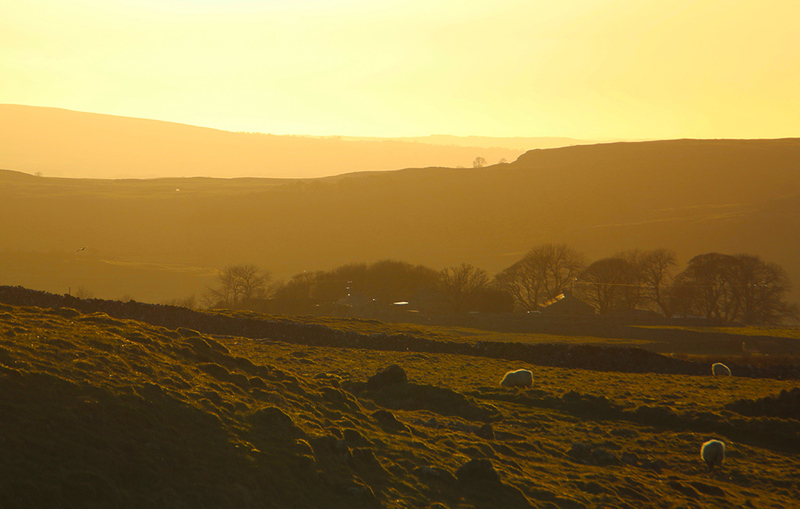 I left the dreamy scene and drove slowly back towards Langcliffe, watching the dales country waking up as the sun followed me home, first lighting up the eastern side of Penyghent and Plover Hill. 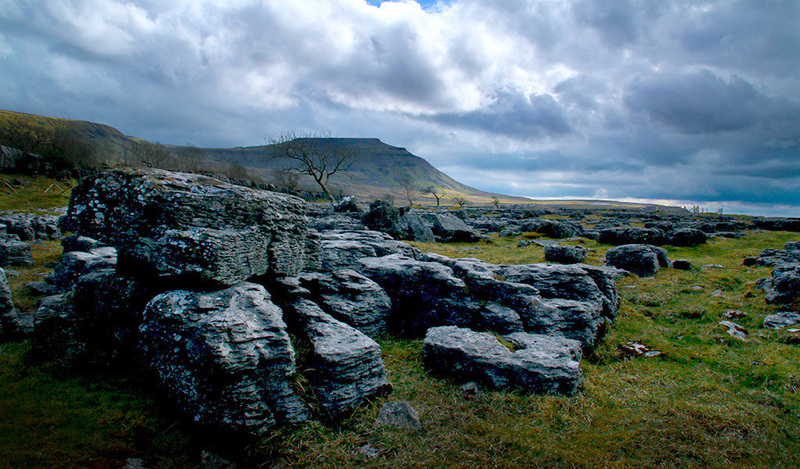 The higher slopes of the distant Ingleborough were next to be illuminated, then the western slopes of Ribblesdale: Little Stainforth, Smearsett Scar. 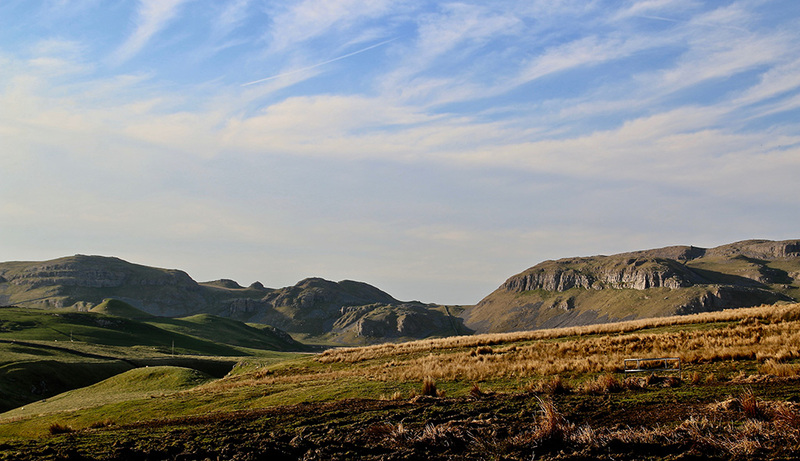 Giggleswick Scar swapped a miserable grey coat for a nice creamy number. 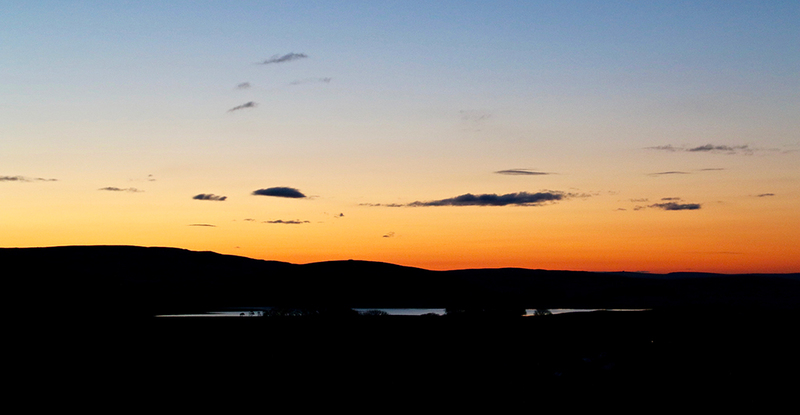 I’ve taken many shots of the setting sun from Winskill Stones but this young light is very different – harsher. Now, in spring, each day the sun shines here the scene becomes greener and fresher. 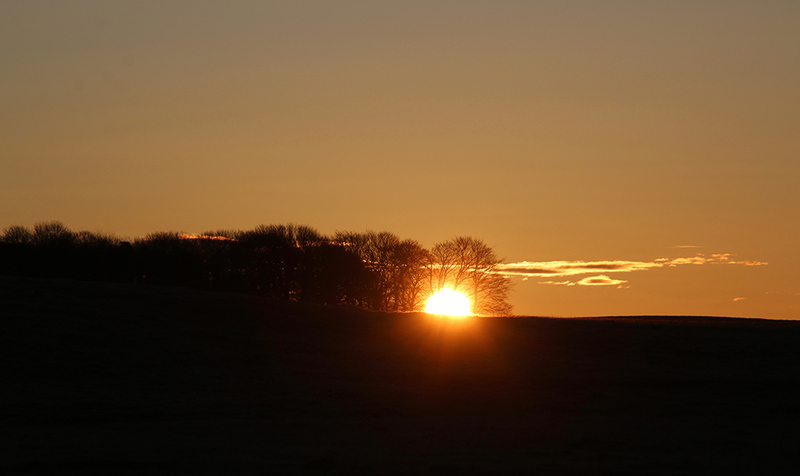 Is the sunrise better than the sunset in the dales? 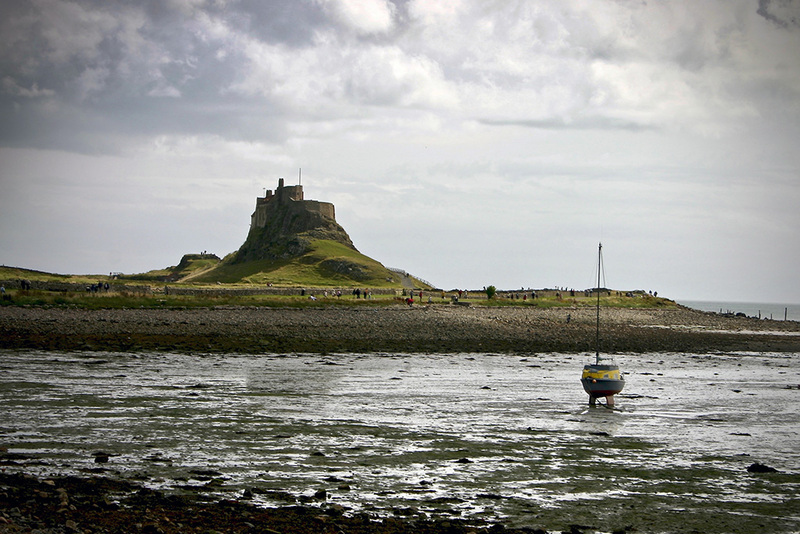 From a photographic point of view I have no preference – they’re just different. Philosophically, is the birth of a new day with its promises and hopes preferable to the death of the day which may have brought us joy and good memories, or perhaps stress and sadness? Sunrise every time for me this time. What do you think? 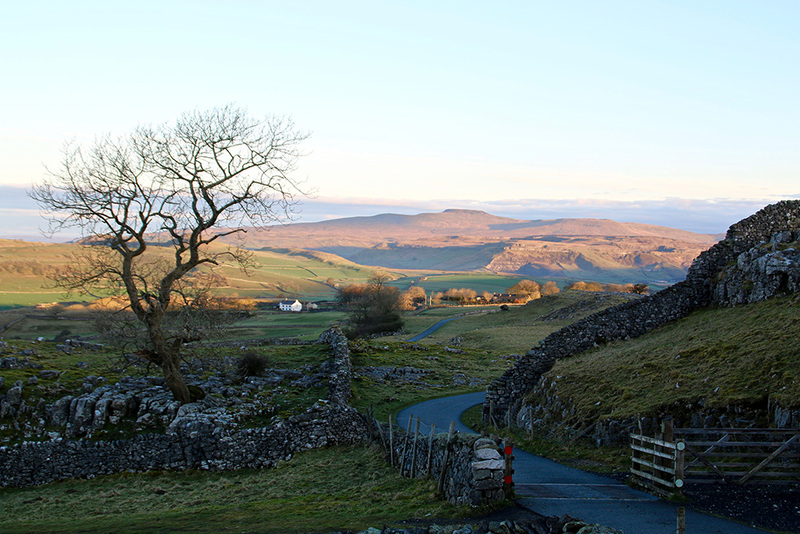 Below is a sunset photo of Ribblesdale taken last week. Since semi-retirement I’ve changed my sleeping habits by going to bed and also rising later than I used to. On work days I would regularly roll out of my pit at 6am – I think it stems back to early teenage years …Dad got up at 5am to go to t’ mill, and he would wake me so I could do my morning paper round before school. Perhaps we should all wake up at dawn, shake hands with the Sun and say ‘thanks for providing another day’. 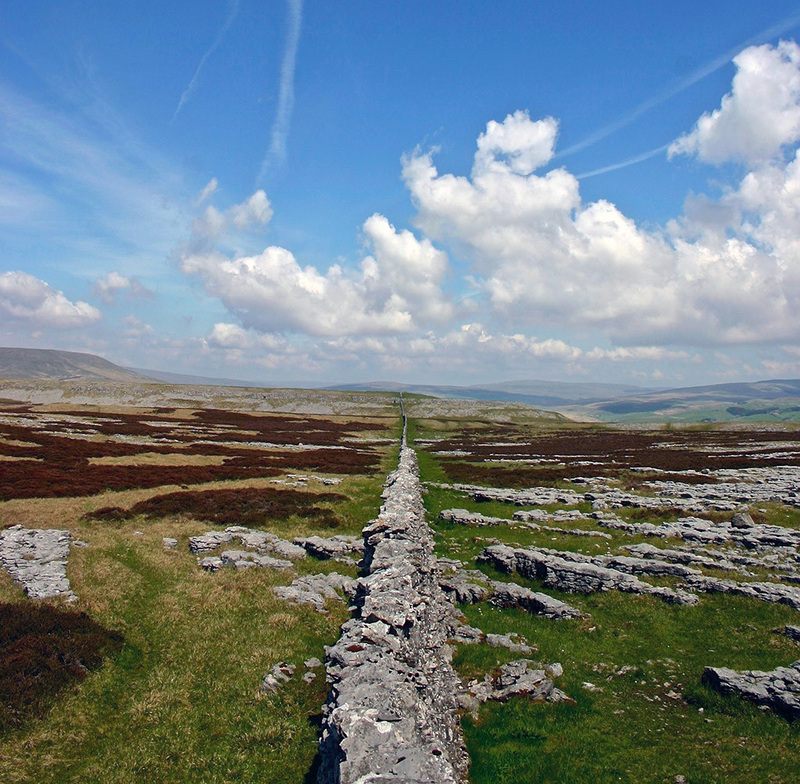 ‘1916: Chronicles of Courage’ is the third in The Folly’s series of World War One exhibitions and highlights the part local dales people played in the war. Not long ago I researched the part my own family played in the war. 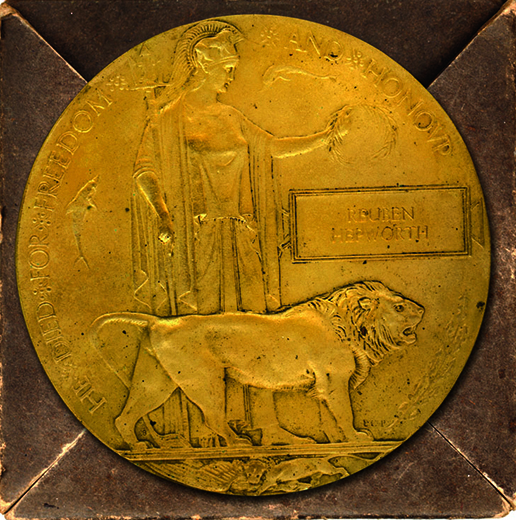 This large bronze medallion – a Dead Man’s Penny, as they were known – was given in honour of one of my granddad’s brothers (he didn’t have a wife or any children) and it is now in my possession. There were more than 1,355,000 plaques issued – a sobering thought. 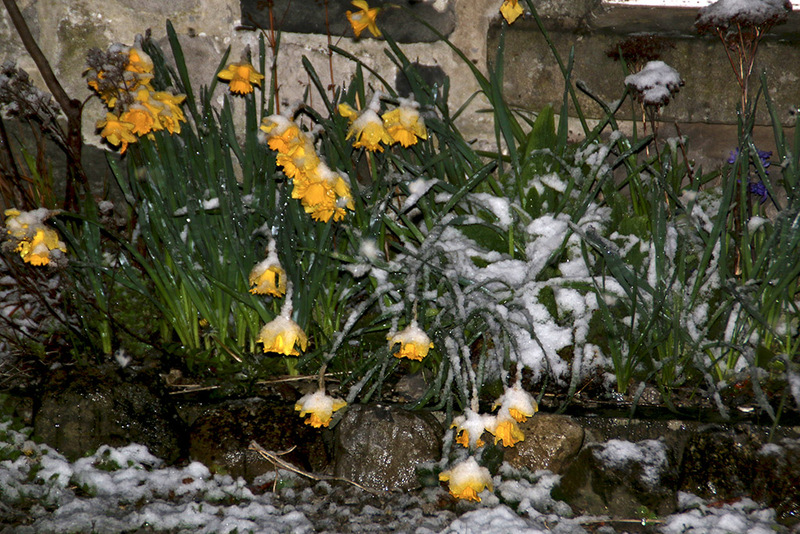 Yesterday morning I was admiring the pink blossom sprouting on a neighbour’s tree under a warm blue sky; in the evening I witnessed some very sad daffodils, their heads hanging low under the weight of heavy snow. That’s dales weather for you. 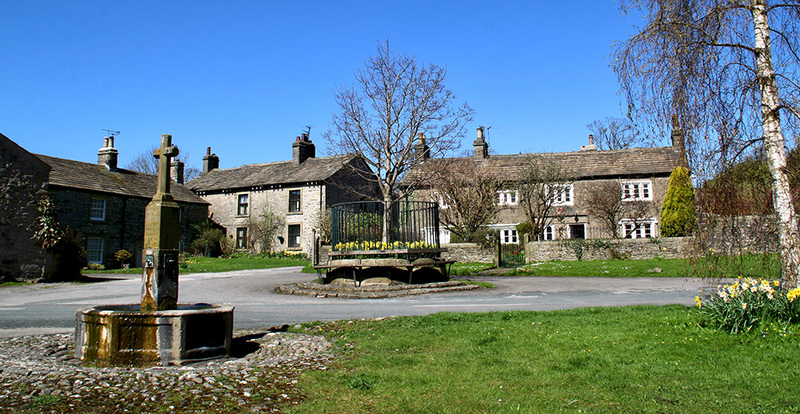 On a beautiful spring stroll around my Ribblesdale village this lunchtime I saw sheep and lambs, horses, a cockerel and hens, pigs, a pheasant, grouse, three different kinds of butterflies, cows, lots of birds… but no bull.